In this day and age where globalisation and a competitive society are ever present, we cannot set aside the importance of Continuing Professional Development (CPD) in our careers and emerging health techs. As our industries evolve, more exciting opportunities and challenges are being created. Einstein said, “Education is not the learning of facts, but the training of the mind to think”. CPD enables a person to continuously train the mind, grow, develop and master his or her craft. It also facilitates learning on areas where one needs to gain more knowledge and it keeps one abreast on the recent trends and developments. CPD is a way to have an edge amongst others, to stand out and remain competitive. But what if you are a busy professional and you have challenges meeting your obligations to professional development? Therefore, we were excited when Dr. Nick Harvey shared with us the Digitalis CPD app which is a platform to help busy healthcare professionals maintain their CPD and compliance while helping organisations maintain the high standard of their members. We find out more about this health tech company, its importance and why it was developed. We also eavesdrop on some tips on how to start a growing health tech company and more. What were the key three reasons why you developed Digitalis? Does CPD really need a shakeup? Yes, I think it does! 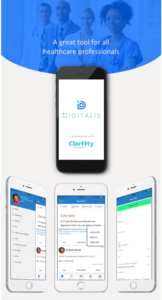 1) Capturing any CPD activity should be quick and easy to do and Digitalis provides a way of doing this. 2) CPD activity should influence what you learn to ensure knowledge gaps are identified and filled. Digitalis presents a feed of suggested learning based on these gaps and areas of interest. 3) Our learning should be shared and discussed! Both for others’ benefit and to inform our own reflections. Digitalis provides a secure platform to do this with your peers. What kind of feedback have you received from your users thus far? on some Android devices, but this is now sorted. People are also asking for a web interface and this is coming very soon now. What are the main challenges you’ve experienced with growing a health tech company? Time and money! Time has been the biggest challenge – the time taken to research, develop, test, pitch, engage, fundraise, etc is massive. Everything takes longer than you think. What is it like wearing many hats as a GP, Entrepreneur and Dad of 4? Time is my most valuable asset and I am still learning to use it wisely! In the last 6 months I have become a part-time GP in order to make space for Digitalis, my duties to the GP Federation I Chair, and of course the children. I have had to become increasingly disciplined with what I commit to and with drawing a line to ensure I spend quality time with my family. On the positive side, I am never bored! What are your plans for Digitalis in the near future? Having proven the concept of Digitalis on a small scale, we are currently fundraising so that we can accelerate the development of enhancements and commence marketing and increased engagement activity. Once the Web App is live, we will be focussing on premium features and organisation-level access. What advice would you give to doctors looking to solve a problem using tech? If it is a real problem you are seeking to solve, then my first piece of advice is not to give up. It’s not easy, so make sure you are passionate about it, understand it well and talk about it with anyone and everyone. Find people who will be critical. Become the hustler (salesperson) and build a team with a hacker (engineer) and a hipster (creative designer). Build a business not a just a product.